As one of two main ownership partners in Seattle's expected NHL team, Hollywood producer Jerry Bruckheimer brings creativity and connections that could quickly enhance the product. Hollywood producer Jerry Bruckheimer paused from shooting movie scenes onboard an aircraft carrier off Florida’s coast last week to talk some Seattle hockey by phone. Bruckheimer is filming “Top Gun: Maverick,’’ starring Tom Cruise, having recently wrapped up shooting and started editing on the Will Smith movie “Gemini Man’’ with director Ang Lee. Cruise resides in Clearwater, Fla., where Bruckheimer met with him to discuss the film’s script ahead of grabbing initial shots. But one of Bruckheimer’s biggest productions upcoming is more about ice than celluloid: Hoping, as one of two top NHL Seattle ownership figures, to bring professional hockey here. 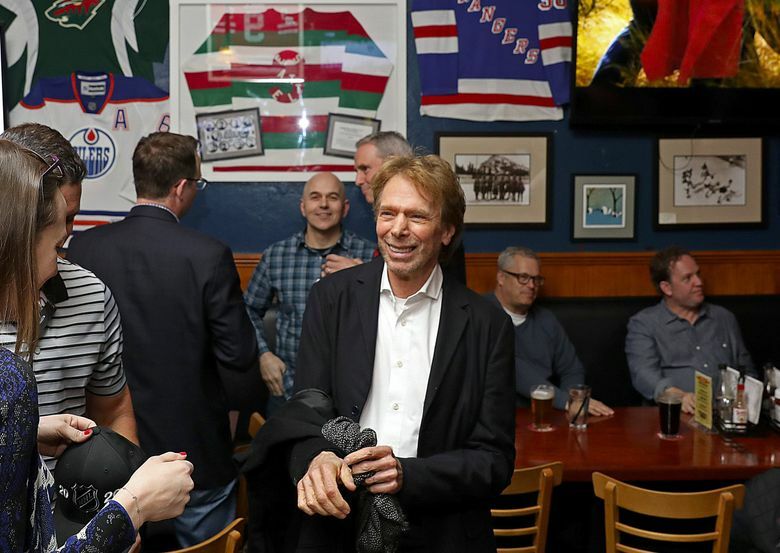 Bruckheimer carved a Seattle trip into his shooting schedule this month for an Uptown meeting of the NHL group’s board. It discussed an October presentation he’ll help give in New York to the NHL executive committee, which, if approved, would go to the full board of governors for a December expansion vote. For now, he and NHL Seattle managing partner David Bonderman await KeyArena renovation approval and are planning the future team’s practice facility. Bruckheimer would love to put a United States Hockey League (USHL) junior team in that facility as well as a “West Coast version” of the U.S. National Development Team program based just outside his native Detroit in Plymouth, Mich.
On that NHL front, he has met with future local-ownership partners. But let’s face it: The man behind iconic movies and TV shows is unlikely to leave his NHL mark strictly from a business perspective. Multibillionaire Bonderman is the project’s main moneyman, leaving ever-creative Bruckheimer, dubbed “Mr. Blockbuster’’ in Hollywood, room for additional impact. Speaking of team names, Bruckheimer sounded flattered that “Kraken” — a fictional sea monster from his “Pirates of the Caribbean” movies — seems popular among local fans. Though he wouldn’t speak to it, an obvious Bruckheimer fit would be spearheading a real-time documentary on the franchise’s launch — similar to Amazon’s “All or Nothing” episodes on the 2017 Dallas Cowboys season. OVG has courted Amazon as a sponsor while Tod Leiweke was a top NFL executive when the Cowboys documentary evolved. Bruckheimer can also draw upon Hollywood star power. He has for years hosted a weekly Sunday-night pickup hockey game in Los Angeles with producers, agents and celebrities such as Cruise and Cuba Gooding Jr. joining him on the ice. There’s also a weekly Monday-night game held by hockey agent Pat Brisson drawing many of the same players, including Bruckheimer. NHL players attend both come summer. Hall of Famer Chelios and others from the games also participated in a celebrity tournament Bruckheimer used to stage in Las Vegas. Bruckheimer said he’d consider something similar here — whether an annual or regular gathering — to promote the team and practice facility. “I think that would be fun to do, get a bunch of bums like me and play pick up,’’ Bruckheimer said. Raised in Detroit, his salesman father took Bruckheimer to Red Wings games in the 1950s at the old Olympia. High atop the rafters, they’d watch legends such as Gordie Howe, Ted Lindsay, Alex Delvecchio and Terry Sawchuk. Years later, ensconced in Hollywood, he met Howe after the Hall of Famer’s wife, Colleen, asked for Bruckheimer’s help with a book about her husband. Bruckheimer connected them with a publisher and writer. In March 1994, Bruckheimer met Wayne Gretzky after he scored his 802nd goal to surpass Howe for No. 1 all-time. “I got to go to the locker room and get a photograph with Wayne and have been friends with him ever since,’’ Bruckheimer said. Gretzky in May 2000 became an owner of the Phoenix Coyotes. Bruckheimer soon caught that same ownership bug, attempting with Bonderman to buy the Pittsburgh Penguins. They later explored an expansion franchise for Las Vegas before the late-2000s real-estate crash there. Now, they’re looking at Las Vegas again — particularly the Stanley Cup finalist Golden Knights. Bruckheimer isn’t the first Hollywood guy to borrow from somebody else’s plotline. But whatever happens next, given his track record, look for some creative, unique spinoff into a Seattle blockbuster to call his own.